There is a tried and true Jewish method in Europe to garner instant media coverage and awards of recognition: Scream the trendy anti-Israeli slogans equating the Jewish state with Nazi Germany and the former Apartheid regime in South Africa while highlighting one's background as a Holocaust survivor. 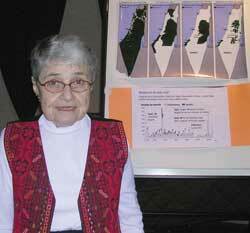 According to seasoned media observers in Germany, the formula of Shoah survivor coupled with anti-Israeli activism helps to explain the public relations coup of Hedy Epstein, an anti-Zionist 85-year-old German Jew who fled the Nazis in 1939, and is now promoting her hunger strike in Egypt to advance the so-called "Free Gaza movement." Epstein declared her hunger strike on Monday, as part of a campaign involving 1,400 activists from 42 countries who traveled to Egypt to enter Gaza, to compel Israel to end its restrictions on the Hamas-controlled Gaza Strip. She has attracted widespread press coverage in Europe. Prompting the activists, many of whom are from organizations affiliated with the terrorist entity Hamas, to march into Gaza, is the one-year anniversary of the start of Israel's Operation Cast Lead to stop Hamas rocket attacks on its southern periphery. The European laws of supply and demand (similar ones apply on many American college campuses) show an endless demand for Jewish senior citizens willing to invoke anti-Israeli language that meets the definitions of contemporary anti-Semitism. According to a Jerusalem Center for Public Affairs report, Epstein had "compared Israel to a Nazi state and Israeli soldiers to Nazis" during a lecture at the University of California, Santa Cruz. Writing this past week from Beirut, the liberal Huffington Post blog site reported that Epstein said, "The issue for Israeli Jews and the American Jewish community is the Holocaust, and everything is due to the Holocaust. But Israel is not being persecuted now. Israel is the persecutor."